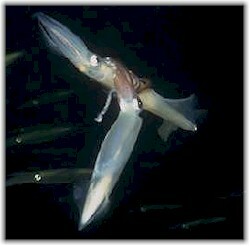 Opal squid are found along the west coast of North America from southern Alaska to Baja California, with the most significant populations occurring off the coast of California. Opal squid live at depths from the intertidal zone to about 250 metres. Opal squid have an elongated, tapered mantle with two triangular fins and a head with large eyes, eight arms and two feeding tentacles. 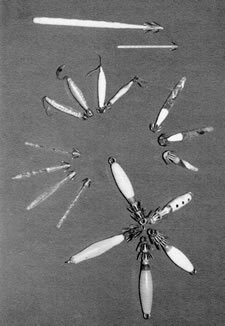 When at rest, their flesh is a translucent white, with a faint bluish tinge and blue-green opalescent patches. However, they can change their colouration when their mood changes or when they are trying to blend in with their surroundings -anything from an angry red to a mottled gold. Opal squid grow to an average of 15 to 20 centimetres in length (not including tentacles) and weigh between 14 and 70 grams. They live less than two years, and males grow larger than females.